A couple of small Sedum plants (species unknown) growing in crushed rock on a glacial moraine. For the story, see HERE. Followed the links. What a wonderful place. I have the same but different, very different. Very nice! Sedums will grow just about everywhere! Very beautiful Rik. This is actually the first time I have seen them in the wild. I have a few in my rock garden. Beetleman, sedums are very common at higher elevations in my area. The way they grow here, they fully deserve their name. Stone crops, that's where you'll find them. The one shown here is unusually succulent, with those bladder-like leaves. 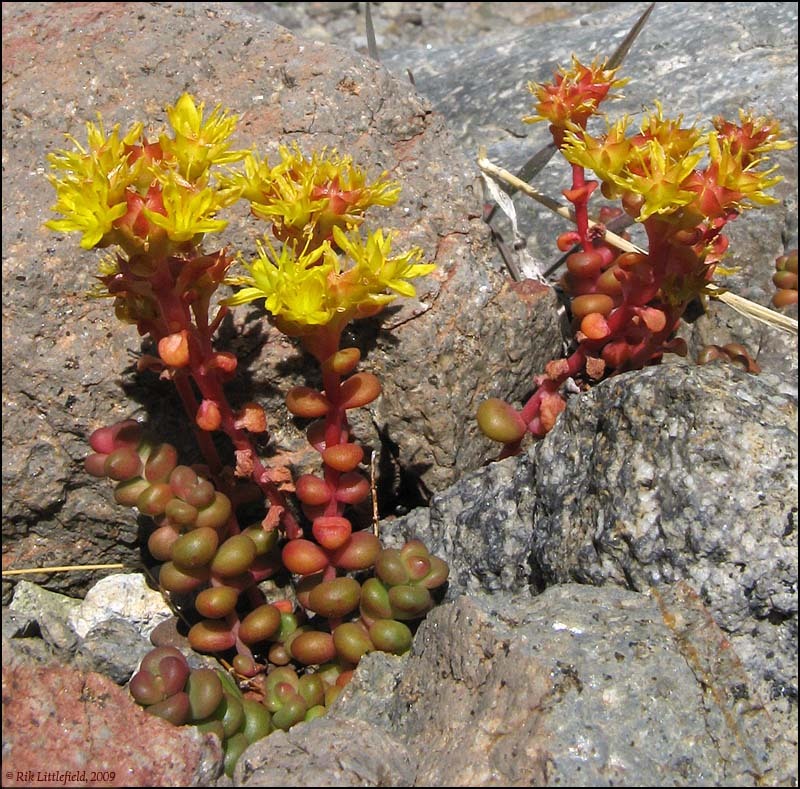 I just looked up Sedum in Hitchcock & Cronquist, "Flora of the Pacific Northwest". It seems there are only two species in this area that have opposite leaves on the flower stems. Only one of those is listed in the University of Washington's online herbarium. So if I had to bet, I'd put my money on Sedum divergens. But I can't really distinguish it from Sedum debile, which is not shown in the online herbarium and which Hitchcock & Cronquist distinguish by technical characteristics that can't be seen clearly in this photo. So since I don't have to bet, I think I'll just leave it as "some kind of Sedum".